While working on a “rails to trails” project for the City of El Dorado earlier this year, I started thinking about the thousands of miles of abandoned railroads across the United States. 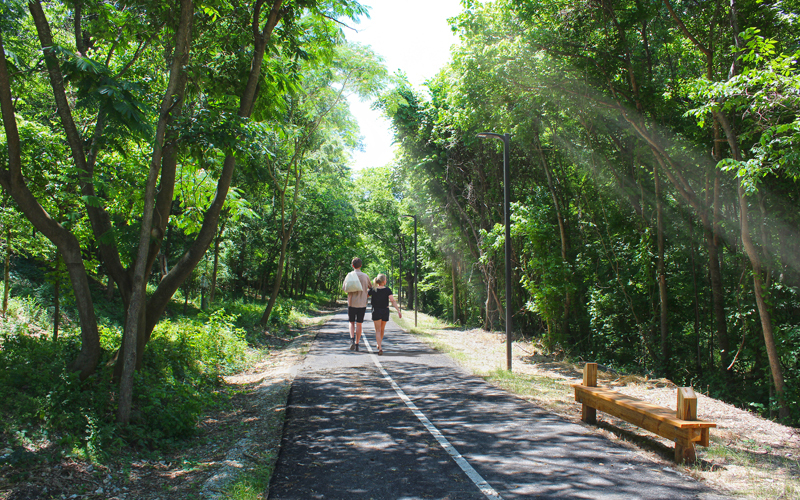 The Rock Island Greenway intends to convert the now defunct Rock Island Railroad to a paved trail system connecting El Dorado, Arkansas to Ruston, Louisiana and beyond. A quick google search found that during the height of the American railroad industry in 1916 there were roughly 254,000 miles of active railroad. Today, less than half are still operating. Further research led me to a 2016 article published in the National Recreation and Park Association’s (NRPA) monthly magazine, in which co-authors Lisa L. Gezon, Emily McKendry-Smith, and Anne Kristen Hunter identified many of the economic benefits of adding trails and trail improvements. Among the benefits mentioned – increased property values, boost to local businesses, increased demand for space in depressed areas, and increased tax revenues. As a civil engineer, my goal is to help municipalities understand these benefits, as well as the many funding opportunities available through federal, state, and local government grant programs. One of the best parts about turning old rail corridors into thriving trails is that we are making something new from existing infrastructure. Not only is this cost-effective, but it also highlights the history of the community in a meaningful way. Trails not only provide recreation but an alternative mode of transportation, which in turn reduces overall infrastructure costs. Often, cities are onboard with turning unused railways into a feature for the community – but they are unsure how to pay for them. With this in mind, we help cities and towns navigate the application procedures to secure funding for transportation enhancements and construction of recreational trails. The Rails to Trails Conservancy provides a Toolbox on their website with links to the various methods available through federal, state, and local programs. To give some idea of potential funding, in the fiscal year 2017, the United States Department of Transportation (USDOT) Fixing America’s Surface Transportation (FAST) Act authorized distribution of $835 million dollars for transportation alternatives projects. In 2020, that number goes to $850 million. Projects that successfully receive funding typically require a 20% local match of funds. The combined federal and local money can be used to convert old railroad corridors into trails for cyclists and pedestrians. Now that we know how to pay for these improvements, let’s talk about the cost-effectiveness of turning abandoned railways into trails. According to an article by Jessica Leigh Hester, Mapping the Ghostly Traces of Abandoned Railroads, experts have “cataloged some 2,500 lines, covering more than 60,000 miles” of deserted railways; which means, no matter where you are, chances are good there is a non-active railway nearby. Often, these routes contain old train depots, which provide perfect opportunities to build trailheads at a fraction of the cost of an entirely new construction. Another significant financial benefit is that subgrade, drainage, and other structural components are already in place. Add to that the increased likelihood that right of ways or easements may already be in place or easily obtainable and the appeal is clear. Likewise, the Walton Family Foundation recently released a study showing $137 million in benefits to the local Northwest Arkansas economy and health due to investments in trails and other cycling infrastructure. The statistics cited are by no means a comprehensive list of the economic benefits trails provide. In addition, trails influence economic development by attracting companies looking to relocate, encouraging community revitalization, providing commuters additional transportation options, and reducing fuel expenses. Moreover, the financial return on investment is far greater than the initial costs associated with trail projects. While the economic benefits are one of the main draws, the aesthetic benefits are substantial. Mature tree canopies along old rail routes provide natural shade for users. Many abandoned railways come with existing bridges or old trestles that can be easily improved or repaired to provide interesting design elements. The benefits of increased activity trails offer can reduce healthcare costs in the communities where they are located. Trails have the ability to connect communities along routes previously separated from vehicular traffic. This increased connectivity allows opportunities for development between neighboring towns. Earlier, I mentioned our current Planning and Civil Engineering work on the Rock Island Railroad. The first step is a feasibility study to help identify stakeholders, establish general alignment and rail conditions, prepare cost estimates, and determine the phases of the project. Our goal is to make the design process seamless and transparent and ultimately for the local communities to have a trail that will serve generations to come. For more information, or to find out how we can help you start the process, contact us using the form below.